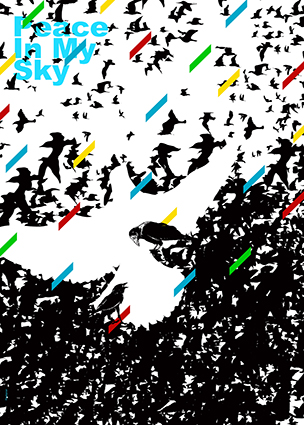 Black silhouettes of birds are clustered in the foreground; above, in the background, silhouettes of various birds fly. Green, yellow, red, and blue quadrilaterals are imposed atop the image in a diagonal pattern. 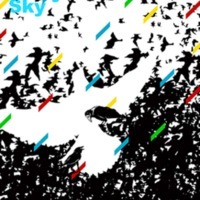 Alireza Khakpour, “Peace in My Sky,” Peace Posters Dialogue Project, accessed April 23, 2019, http://peaceposters.oberlincollegelibrary.org/items/show/348.